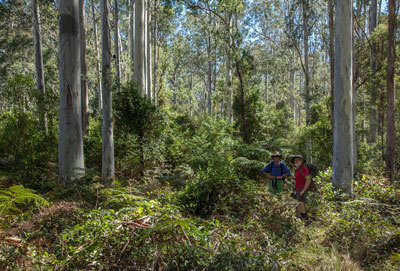 Blue Gum Forest has been a magnet for bushwalkers for nearly a hundred years. Ian explores why the Forest is such a special place and the many tracks that can take you there. On a late-autumn afternoon I close the car door at Perrys Lookdown and start down the track, my pack heavy with camping and photographic gear. At the lookout I pause, leaning on the fence over the very rim of the gorge. A eucalypt-scented breeze wafts up against my cheek. A southerly has just blown through and its one of those ice-clear days, the incandescent cliffs casting a warm glow into the cool blue shadows of the deeps, growing deeper into evening. 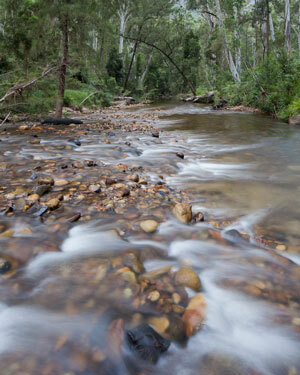 There, where the gold-rimmed forest gorges of Govetts Creek and the Grose River come together, rise the tallest trees. A shard of glass water glints between. Like thousands before me who have wondered at the brink of this remarkable valley, I’m thrilled with the grand sweep of it and with the anticipation of being down there, in Blue Gum Forest. It's going to be a beautiful evening. I’ve travelled the Perrys track dozens of times. Its very like Napoleon, or Mike Tyson: short and brutal. This quickest way into Blue Gum tackles huge, punishing steps down a steep spur. Climbing back out is even worse. Heaving up the steps and finding intermediate edges to reduce the strain takes full concentration. In summer it can be an oppressively hot ascent, and a blessed relief to crawl into the top gully of cool rainforest and then to the breezy lookout. Over the years five people have died before they could get there - caught by uphill bushfires they could never outrun. Ernest Docker found the way through the cliffline in 1875, and the rough-hewn Dockers Ladder was the key to the pass for many years. The road used to stop three kilometres back at Hat Hill, but in 1939 it was extended to the edge of the cliff. Then in 1946 the Perrys descent was reconstructed with funds from the Rover Ramblers, a bushwalking club started by Paddy Pallin. It's true: I’ve seen people arrive breathless at the ‘big tree’ at the bottom, carrying nothing, take a quick squiz at the edge of this fabled place, then turn and wheeze back up the ridge. And yet the Forest remains, aloof and unmoved, ready to reward the more relaxed and attentive visitor. For many NSW bushwalkers, Blue Gum holds special memories as the venue of their first overnight trip. I myself chose Blue Gum for my first walk alone. And how many have taken their children there? This time on Perrys, I totter down to the music of bellbirds rising up to greet me from the blue gums. Once below the lookout, there are no views as such, but through a filigree of trees flash glimpses of the enfolding sandstone headlands — The Fortress, Lockleys Pylon, the massive face of Mount Banks. There is a strong sense of entering a great abyss, an inverted ‘lost world’ where time ticks by more slowly; where things might remain as they have always been. Finally the first blue gums appear, straight-rising from the ferns. As the pile-driving steps abruptly give way to a gentle slope, the track bursts into the lushness of the Forest: always green, always moist. The violence of the descent is replaced by a pervading calmness. Just like on the Franklin River, when you crash down the final rapids to emerge into the sudden peace of the Irenabyss. Again I am reminded that this is a holy place. 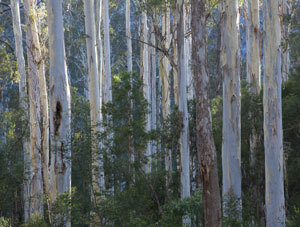 And not only for its human meanings: Blue Gum Forest grows here because the ground is blessed by nature. I’m sure it was this ‘other’ that so energised those bushwalkers back in 1931. Clarrie Hungerford of Bilpin had a lease over part of the Forest (but it didn’t have a name then). He said he would cut down the trees and plant walnuts. They loved this place, the bushwalkers; they could never bear its loss. If it was a ruse by Hungerford, that didn’t matter: they resolved to buy him out and return the lease to the community. It was a tough option in those dark days of the Great Depression. Money was short and Hungerford wanted a lot of it. But the bushwalkers were a force to be reckoned with - a force of nature, perhaps. On a rainy 15 November the bushwalkers made their way into the valley to negotiate. Hungerford felled a tree. A price of £130 was agreed, with payment by the end of the year. The Blue Gum Forest Committee wielded all the grass-roots tactics still used in campaigns today. Some private loans got them through in time, but it was the end of 1933 before all were repaid. 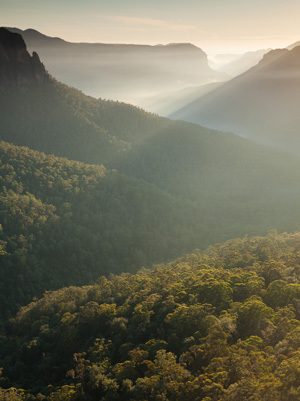 The reserve was proclaimed in September 1932 and absorbed into the fledgling Blue Mountains National Park 31 years later. 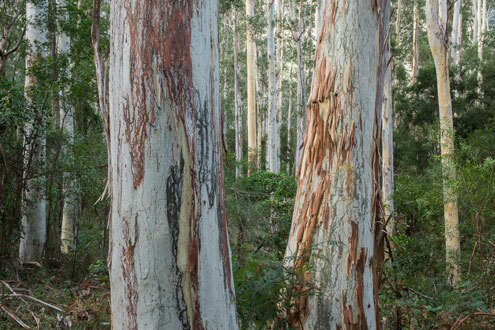 The struggle for Blue Gum Forest is now regarded as Australia’s first public environmental campaign. It was the beginning of many such battles which bushwalkers have led, all over Australia. But for the NSW faithful, it is a foundation story bordering on the sacred. Myles Dunphy, a legend in bush exploration and early wilderness activism, was probably both concerned and emboldened by the Blue Gum battle. 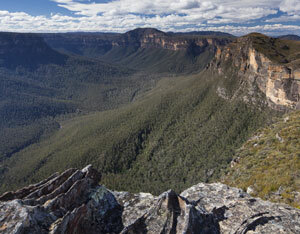 For years he’d been secretly working on a grand national park scheme for the Blue Mountains. 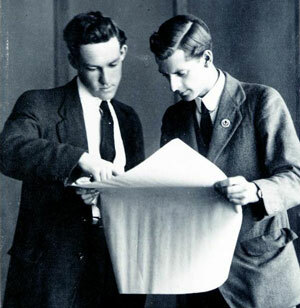 In 1932 he took it to the authorities and in 1934 went public in the Katoomba Daily newspaper. Dunphy’s claim for 460,000 hectares of bushland was breathtaking and visionary. It was 1959 before a Blue Mountains National Park was won, but new generations of activists (including Myles’ son Milo) made sure that the promise of Blue Gum also led, relentlessly, to many other parks and wilderness areas. After a continuous campaign of nearly 70 years, Dunphy’s heroic vision was finally matched and surpassed in 2000 with the crowning achievement of the Greater Blue Mountains World Heritage Area. Before setting up camp at Acacia Flat, I put down my pack and stroll beneath the trees, silently thanking those that made this place safe for all time. 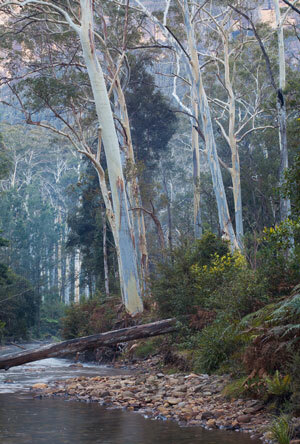 Anyone with a bushwalker’s soul and who cares for our heritage should see Blue Gum Forest. But don’t rush, make it a journey. Make it many journeys, over a lifetime. Camp down there and rest before the unavoidable 600 metre climb back out. Walk in one way and out another - there are six well-worn tracks to choose from. They all take you from a plateau lookout, down the cliff and into the valley, yes, and yet each is a special experience of its own. Take Govetts Leap. In 1899 it became the first constructed track into the valley, with a hair-raising pass hewn into the 200-metre cliff-face. The next year Rodriguez Pass was linked down through the valley and up to Evans Lookout around the corner. The incomparable view from Govetts Leap Lookout takes in Govetts Leap itself—the highest single-drop waterfall in the region. As you descend, with a vertical swampland dripping onto your head, or with slick winter ice coating the steps, just think of those poor early track-builders suspended by ropes. In spring the green cliff-face is a riot of orchids and sundews, but occasionally it wallops the track with huge falling sods! At the base of the falls, gaze up and see the water sun-shattering into a myriad droplets that swirl in the slightest breeze. 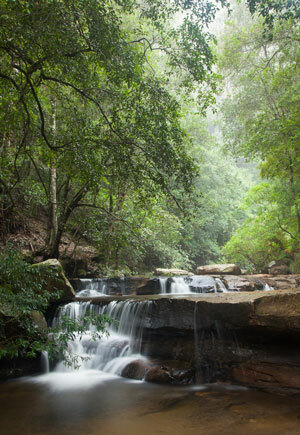 Then enter the rainforest to wind down along the creek with the constant sound of falling and rushing water, mostly hidden in the dense growth but then appearing as cascades over mossy boulders. Hundreds of beautifully-hewn stone steps are a testament to the trackmaker’s art and effort, until Junction Rock is reached. Turn left and an unmade ‘goat track’ spiders along Govetts Creek towards the Forest, crossing the best water in this part of the valley (Orang Utang Creek). The route probably originated in the early 20th century as a horse and cattle pad. Turn right from Junction Rock to continue on Rodriguez Pass towards Evans Lookout. A short way along Govetts Creek, the overgrown Horse Track takes a more direct and utilitarian route to the plateau. It was perhaps the first white way into the upper Grose, and as one of the few natural passes it was also an Aboriginal route. An excellent tool-making stone we call chert outcrops in layers below the cliffs. Continuing along Rodriguez Pass, the track reaches a stately grove of turpentine trees and turns up Greaves Creek. 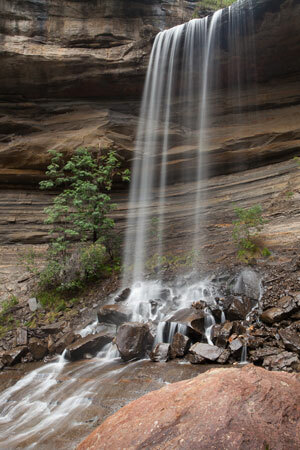 It climbs past tumbling cascades and boulders to Beauchamp Falls and then to the bottom end of our own Grand Canyon. If you’re not a canyoner, here’s your chance: this is the only one of the area’s famous slots reached by a constructed track, and the exit via the Grand Canyon Track (1906) is an absolute eye-opener. The quicker Rodriguez Pass ascends a gully of verdant rainforest (The Fernery) direct to Evans Lookout. 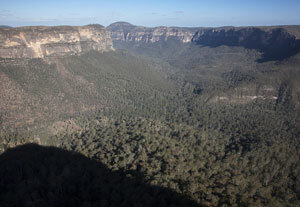 The longest track starts from Victoria Falls Lookout near the head of the Grose. 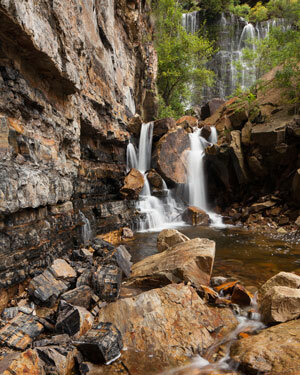 It twists down to the delicate curtain of the falls tucked into the lush valley, then a poorly made track follows Victoria Falls Creek to the Grose River at Burra Korain. A small campsite shelters here under grey myrtles, for its a solid days’ walk right through to Blue Gum. The next part of the walk follows one of the oldest built tracks in Australia. Or at least its supposed to, but most of the formation has long been dishevelled by plant growth, landslips, floods and the scratching lyre-birds that are often in earshot along here. In 1858-59 the Engineers Track was constructed the full 64-kilometre length of the Grose River in preparation for a railway across the Blue Mountains. But the track was barely finished before the gorge was declared hopeless for a train. Today, you can laugh at our forefathers’ folly as you duck and weave and slip and slide along a pad that seems to have been made by a wandering cow. But don’t forget to look around - especially at the richly mixed forests along the river and the intensely orange and black Birrabang Walls high above. Its just a few kilometres from a highway but down there in the depths it feels like a million miles. After all, this is the Grose Wilderness. About half way between Burra Korain and Blue Gum, the Pierces Pass Track enters from the left. Regarded as the gentlest way to the Forest, its construction is a mystery - except that it was upgraded for cattle by Hungerford and his mate Bert Pierce in 1930-31. Long before that it was another Aboriginal way, and there are old coal-mining adits nearby. Pierces starts from low on the plateau and descends into a delightful ravine of rainforest which is followed through the cliffline. Coachwood and sassafras trees crowd together to squeeze out the light above a clean-water creek. Suddenly you turn a corner and burst out into expansive views across the valley. The descent to the river is relatively benign, but there’s no shortage of steps. In springtime, the open forest might be ablaze with waratahs. Lockleys Pylon could be the roughest track to Blue Gum Forest, but it also offers some of the finest views and a remote ambience. From the long dirt road along the Mount Hay Range, a worn pad rolls over a wide-open heath studded with rocky knolls. In sun or fog, the spacey walk to Lockleys Pylon is well worthwhile in itself. From the pyramidal summit, vistas spread out along all three arms of the valley. Lockley was a Sydney Morning Herald journalist who backed the Blue Gum Forest campaign, but the origin of Lockleys Track is unknown. Its never had much construction. From the pylon, it winds down a crag-bound ridge and dives steeply over the edge at the last windblown gap breaching the cliff. Sneaking through towering orange rocks, the pad descends a long spur direct to Blue Gum. The loose rocks and sparse and stunted vegetation testify to a tough life. The sun beats down onto the north-facing slope and every decade or so a bushfire blasts up the hill. In summer it’s a relief to drop into the coolness of the tall gums. It's good that camping is not allowed in the Forest itself anymore, and that the last of Clarrie’s wild horses and cattle are gone. Blue Gum these days is often empty of people and their bustle, and inspires a reverence of soft steps and quiet voices. As I wander, my eyes are drawn up by the pale-skinned, soaring trunks to the canopy where the bellbirds chime. Round leaves stipple sparsely against the sky, and patchwork pieces of ochre sunset sandstone shine between. Skylight falls softly to play over fields of rasp fern and swarming water vine. Unseen, the creek and the river slip and ripple through the Forest. Even they are briefly calmed on their splashing course by the gentleness of this place. 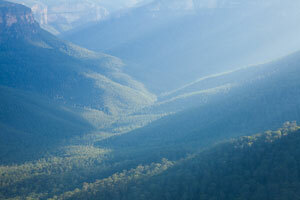 Back From the Brink: Blue Gum Forest and the Grose Wilderness, Andy Macqueen. Grose Valley Walking Tracks, NSW National Parks and Wildlife Service.